Sure, people buy cars for millions at Scottsdale's Barrett-Jackson auction. But others score cheap deals on cars for $2,200. You may have heard that a 1958 Ferrari California recently sold for $8.25 million at auction in Scottsdale, Ariz., but these auctions aren't just reserved for the ultra-wealthy. There are also opportunities for up-and-coming enthusiasts to begin their vintage car collections with items like these cars and trucks that sold at Barrett-Jackson for less than $20,000. Often much less. 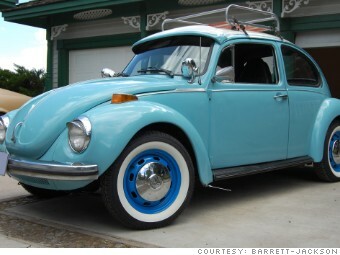 Case in point: Complete with a roof rack with wooden slats and cool blue-painted wheels this is one very nice-looking Beetle. And, according to the Hagerty Collector Car Price Guide, the winning bid of just over $6,000 was about on the money. Maybe even a little low. All prices shown here include a 10% buyer's commission.